Recently, Barista Hustle posted a very interesting video on YouTube. I am embedding it to this blog post to make sure that you view it before reading more. I found this video rather illuminating, but at first the last minute or so was a bit confusing to me, so I decided it may be worth discussing it here. The most illuminating part for me was the fact that a very long immersion brew with coarse grounds never reached the higher extraction yields that the finer coffee grounds reached. Here, this higher extraction yield is about ~25%. To those wondering why the fraction of extracted coffee is not higher, it is because ~30% roughly corresponds to the fraction of coffee beans by mass that can be dissolved in water (this is discussed a bit more in a previous post). The rest consists of cellulose walls and other stuff that cannot be dissolved, and remains in the coffee bed. This maximum extraction yield will depend on the type of coffee beans and the roast profile you used, so you may sometime hear slightly different numbers. When you think about it, it makes a lot of sense that water is just unable to reach the core of each coffee particle when you use a coarse grind setting. The typical size of a cell inside a coffee bean is about ~20 micron (see image below), and when we brew for a V60 filter coffee we typically have a majority of particles with diameters around 500 micron. This means that water would need to diffuse through 12-13 layers of cells to reach the core of each coffee particle. What this video from Barista Hustle demonstrated is that water only penetrates about 100 micron, or ~5 layers of coffee cells. An electron microscopy image of coffee beans. This image was obtained by Rebeckah Burke at University of Rochester. Please have a look at her very interesting project here. This means that we are calculating average extraction yields wrong when we grind anything coarser than ~200 micron in diameter, as Matt also mentions in the video. This is because we assume that the full mass of our coffee dose is being extracted when we calculate extraction from total dissolved solids, but in reality there is a large portion of the core of each coffee particle that is still intact, and effectively wasted. This is interesting, but does not provide an easy way to correctly measure the extraction yield – to do this, you would need to know the full distribution of coffee particle sizes you are brewing with. The part I found a bit more confusing was the end of the video. There, Matt mentions that their cupping bowl made with the coarser grounds was actually a high extraction. When I first heard this, I thought he meant that it was a maximally extracted thin shell around the coffee bean, which would mean that the nasty bitter and astringent chemical compounds should have come with it. But when I thought a bit more about this, I realized this is not what he meant. The red (higher-extraction) curve in the video is actually a good representation of how much every part of accessible coffee is being extracted. If the fine grounds (red curve) are not reaching extractions high enough to obtain bad-tasting compounds, then none of the accessible coffee mass is. The shells of coarser grounds will get extracted exactly to the same extent as the fines are, you will just be wasting a lot of intact coffee in their core. At the end of the video, Matt briefly mentions that it is still possible to over-extract coffee and obtain a bitter and astringent cup. This problem will certainly arise if you are trying to extract the full core of a coarsely ground coffee. When you do this, the outer surface of the coffee ground will be super over-extracted by the time you start extracting the core. In effect, this lone, coarse coffee ground will be producing an uneven extraction, a lot like a wide distribution of particle sizes would ! Suppose you had a large number of spherical coarsely ground coffee particles, all with exactly the same size. You would be faced with a choice: either you extract a thin shell of coffee around each particle in a relatively uniform way and waste a lot of coffee in the cores, or you minimize waste and produce a very uneven extraction. An example of what an extraction profile as a function of radius inside a 500-micron coffee particle could look like. The red curve would represent the case where more coffee is wasted (everything inside of ~400 micron) so that the outer shell is not over-extracted, and the other curves would be cases where the brewer tries to minimize waste, but ends up over-extracting the outer shell. These numbers and curves are not drawn from data, they are just used as illustrative examples. 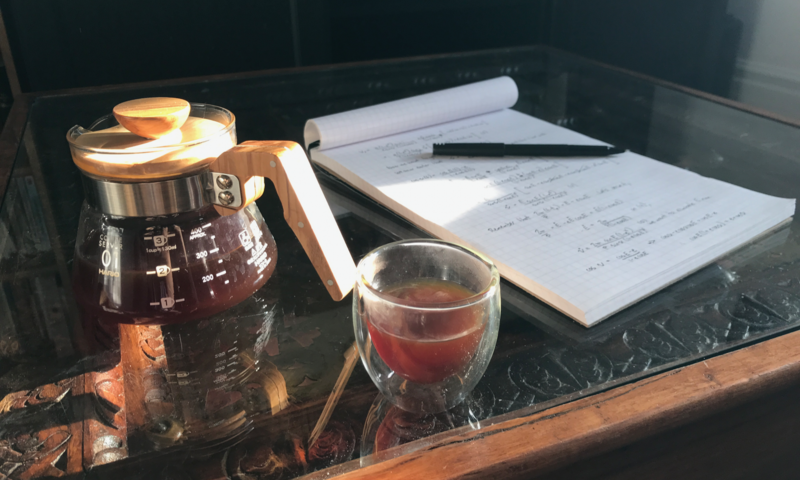 All this discussion made me appreciate more why cuppings produce very balanced flavor profiles, typically produced by even extractions – finer grind sizes are used for cuppings, compared to other immersion methods like the siphon and french press. This makes me want to experiment with my siphon at a much finer grind size ! I would like to thank Mitch Hale and Caleb Fischer for the long and very interesting discussion that led to some of the thoughts shared here. I also want to thank Barista Hustle for their very illustrate experiment ! Thanks you so much. After read this, I will try to brew with finer grind –fine enough but make sure it will not clog the filter– and with faster time –fast pouring. So I could get higher extraction of good stuff from the coffee before the bad stuff extracted. What I learned from Scott Rao, fast brewing time is good to maintain the slurry temperature still hot. It will produce bright crisp acidity. In other word, not a stale coffee. No problem, keep in mind that you want to avoid bitterness and astringency (think of a very bitter green tea or an unripe banana). Grinding very fine is a challenge with V60 because you can clog the filters and restric the flow, which will cause an uneven extraction. Immersion doesn’t have this problem, but the lack of a coffee bed to filter stuff in suspension means that the beverage isn’t as clear. Previous PostPrevious Why Spin the Slurry ?